A young Christopher Robin has a going away party in the Hundred Acre Wood to say goodbye to his stuffed animal friends – Winnie the Pooh, Tigger, Piglet, Rabbit, Roo, Kanga, Eeyore and Owl. 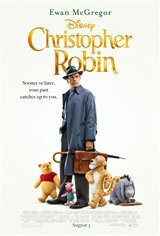 He promises he will never forget them as he heads off for boarding school, but as an adult, Christopher Robin (Ewan McGregor) is much too busy to think about his friends. In fact, he barely has time for his wife Evelyn (Hayley Atwell) or daughter Madeline (Bronte Carmichael), because he's far too busy at work. The company he works for is facing severe cutbacks, so Christopher Robin has to work on the weekend instead of going to the cottage with his family as he promised. Meanwhile, when Winnie the Pooh can't find his friends, he appeals to Christopher Robin for help. Although consumed by work, Christopher still has a soft spot in his heart for Pooh and takes the bear back to the Hundred Acre Wood again, where Christopher is not only able to help Pooh, but remembers the value of friendship.